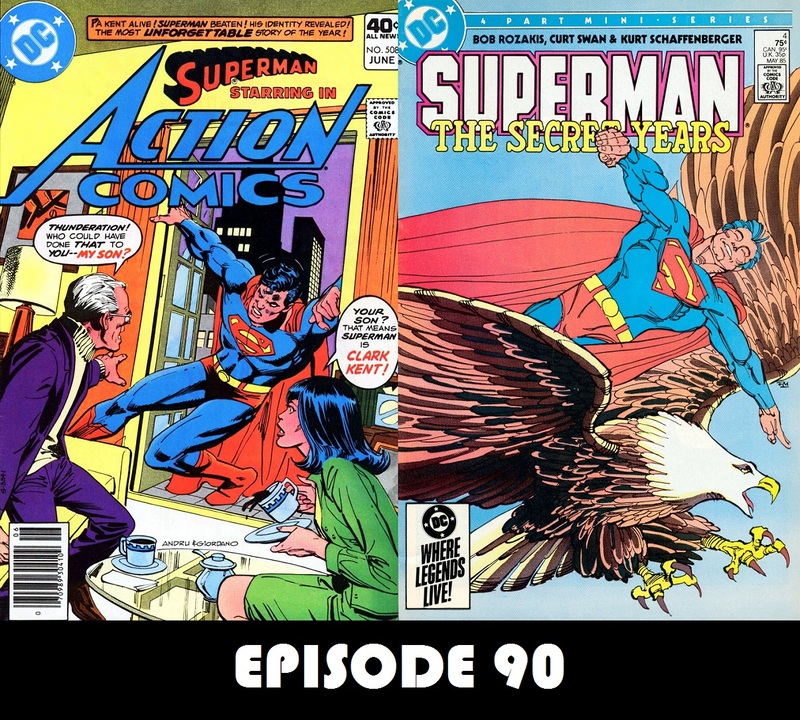 For Episode 90, I am joined once again by Michael Bailey, host of Views From the Longbox and From Crisis to Crisis, to discover exactly how Jonathan Kent returned from the dead, and how it is related to Starshine’s powers. Also, J David Weter presents the final installment of Superboy in the Bronze Age, in which Superboy completes his journey to becoming a Superman. Hello Charlie! (and David)…another stellar episode was Episode #90 with guest Michael Bailey. (If I’m repeating myself in this email from stuff I said in my last email, I apologize) I love this storyline. I would place it in my top 10 or maybe even my top 5 if I had such a list. You might have forgotten to mention that both #507 and #508 were reprinted in Best Of DC Blue Ribbon Digest #11. It was the Year’s Best Stories issue. (it’s also in Superman From The 30s To The 80s and Superman In The Eighties TPB) It’s too bad they didn’t have a similar story before the Bronze Age ended where Martha Kent showed up. Maybe they would have added a “female” hippie criminal. Anyway…great job. The only other thing I wanted to comment on was comic subscription experiences. I remember subscribing three different times for three different titles. (Superman, The New Adventures Of Superboy, and Best Of Blue Ribbon Digests) I honestly don’t remember your so called “Postal Crease”. I still have those comics in my collection and they look fine. My Superman subscription ran out at #404. If I’d have kept going a few more years, I could have gotten #423 for a song. I am pretty sure I paid a hefty price when I finally got it. I remember both Superboy and the Digests were cancelled during those subscriptions. It was fun while it lasted. (To J. David Weter) I wanted to tell you how much I enjoyed your Superboy segments. I have always been a Superboy fan. I always felt sorry for him in comics though because the Legion sort of bounced him out. It was Superboy and then Superboy featuring the Legion and then Superboy and the Legion and then Superboy gets kicked out to his own new book while the Legion took over the old. They were great stories none the less. I enjoyed your coverage..your synopses..and your whitticism. I look forward to your coverage on DC Comics Presents which is another of my favorite books. As of now, I have 71 of the 97 comics so hopefully I’ll be able to follow along with you on most episodes. There is one last thing before I go. Since we are so close to your 100th episode, I was wondering if you’d be able to tell us any plans you have for it..unless your trying to keep it under wraps. I hope you both have a very Merry Christmas and a Happy 2014! PS. Really enjoying your other podcasts…Dave’s Daredevil Podcast, The Starman Observatories, and PADSMASH. Thanks for keeping me entertained at work!! Love your episodes and look forward to the DC Comics Presents feature. I wanted to bring something to your attention, I tried to download episode 90 using the download directly link but it appears to be linked to episode 89. Thank you for bringing this to our attention. I’ll get it fixed.